There are always ideas that unnerve me when I consider taking a trip. A number of things cropped up on this one, and I spent a lot of time thinking about the challenges ahead of time, trying to plan how to manage them. One was the trains, which I would be taking on my own. The other was the language. When we went to Italy, I worried for months about how little Italian I understood, and I kept thinking about how badly I spoke French (and how disdainful Parisians often were even when I did try!) and despite the months I spent practicing basic Italian phrases, I felt utterly paralyzed when it came time to ask for something even as simple as a glass of water. I had the words in my head, I could approximate the accent (well, sort of…I’m pretty sure I speak Italian with a Spanish tint), but I could not get the words to my tongue and out of my mouth. To avoid that syndrome this time, I gave myself permission to speak Spanish as badly–and as earnestly–as I wished. I wanted to rely on others as little as possible. I wanted to be brave enough to at least try. The main worry on this trip was the fact that I would be taking the trains on my own, first from Neal’s mother’s house in Kent, through London and a change of stations, up to York to see my friend Jo. Then I had to return through a different station, navigate stairs and streets, find the Eurail station, and get to Paris. 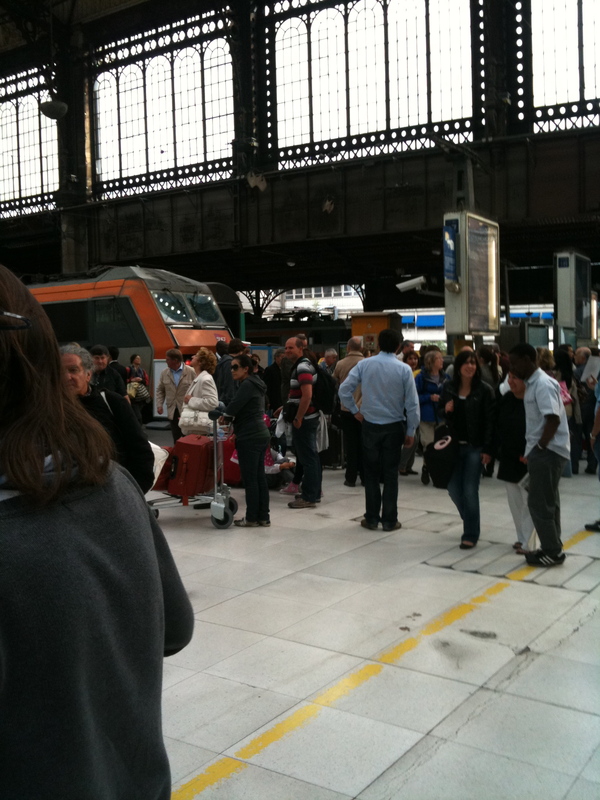 In Paris, I would have to change stations again, and the time window was only two hours. Which theoretically should be enough time to take a cab across the city, but you never know. I fretted. I thought about it a lot. Finally, I knew I would be arriving in Madrid before the rest of my group, and I would have to get to my hotel and check in by myself, with my not-great Spanish. This, too, made me fret, though I don’t think I even had any scenario in mind except embarrassment. One thing I knew from navigating the Tube in London, and the train stations in Italy, is that there are a lot of stairs. A lot of stairs. There are some escalators, but not in all stations, and not in all areas. I didn’t want to have to be lugging a heavy suitcase through all those mazes. My goal was to take only a carry-on size suitcase, and my smallish backpack, and a sturdy, smallish purse I could wear close to my body while looking so touristy. At least I could give myself that gift ahead of time. And it turned out, this was a gift. I did end up going up and down hundreds of stairs through those many stations. Not having a big bag was worth the small sacrifices I made (uh, basically living in the same three t-shirts for nearly two weeks, and they were all misshapen by the end, having been washed by hand in basins across the Camino. In retrospect, I would spend the (more) money to get quick dry tops). I had assumed that I would take a taxi from Paris Nord to Paris Gard to save confusion and worry. When I arrived in Paris, relaxed and well fed from the extraordinary day of travel with plenty of leg room and the niceties of tea and biscuits, with the loveliness of an English summer countryside passing by the windows, then the French countryside, and a full meal complete with wine on the EuroStar that I felt brave. I looked around for the Metro signs and thought, “How hard can it be?” I knew which train I needed and which direction to go. I just had to get a Metro ticket. He said, “I am South African, madam, and I speak Africaans. How may I help you?” He gave me a ticket in two seconds and I was so relieved that I was giddy. I found my train (up stairs, down stairs) and waited. It was busy and I had to go through a busy tourist station (Bastille), but it was fine, and all the way, I was thinking, hey, I did it! I still had to find my train in the station, and this particular station was the site of a place where I stubbed my toe so badly that I ended up losing a toenail, but this time, I found the train, the man spoke to me in Spanish, and I relaxed. Immediately. I found my sleeper car, made myself comfortable, and in the morning awakened to Spain passing by outside the windows. I ate breakfast watching fields tumble by in the mist, seeing cows and a man walking down a road in a landscape that looks very like my own….except for the walled medieval city there on the mountaintop. Which left the last, scary bit—getting from the train station to the hotel, and then checking in without my group and explaining that they would be coming later. Remember, I had been thinking fretting about this challenge for a couple of months. It took two seconds to walk out of the station, find the taxi line, give the man the address I had written down, and get in the car. He drove through the morning light in Madrid, listening to the radio and I drank in the sights. At the hotel, I paid him, he took out my bag, and I went inside, bracing myself to navigate the check in, reviewing the words and names I would need. He spoke English. He had been expecting me. The main group had been delayed by plane issues, and I would have time alone. In my room. I had plenty of time before anyone arrived to…get settled, reoriented, wash underwear and hang it up to dry, take a shower and do my hair, all those things. Sharyn came and we went to find food, ordered blindly off the menu, which ended up being all right, even if I inadvertently ordered pulpo for us both. 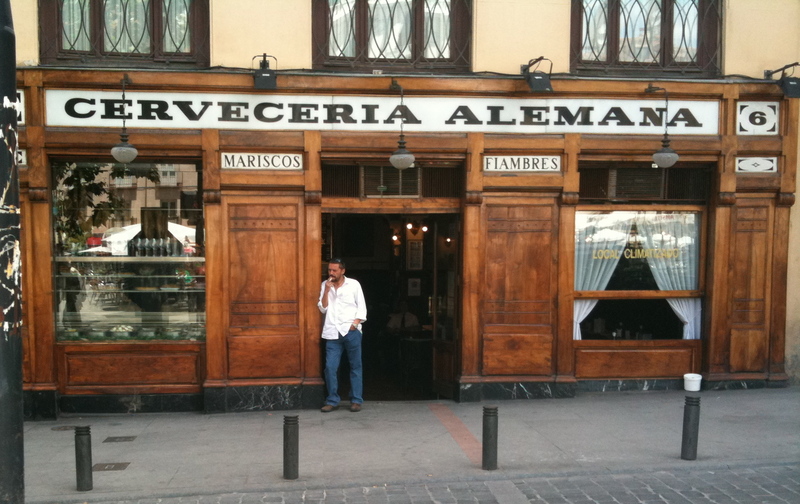 The square was, I think, Santa Ana, where there is a statue of Federico Garcia Lorca, and the bar where Hemingway wrote (also the bar next door, where Hemingway never ate or drank or wrote). We had a meal and went back and by then I felt brave enough to venture out on my own, so Sharyn went upstairs to rest and I wandered around, seeking a supermarket for yogurt and a transformer for my computer. The grocery was tiny and I browsed around looking at things, finding no candy but some interesting cookies. Next door was a bazaar, like a dollar store with everything all jumbled in a dark store with close, crowded aisles and millions of things to buy. I found demitasse spoons, 6 for 87 cents, and since I’d missed looking for them in England, bought two sets. I also found my transformer for 2 Euros and felt like a big game hunter carrying all my booty back to the hotel. 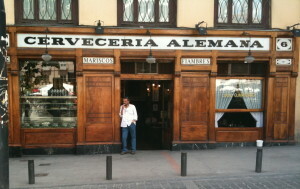 That evening, we went to dinner and got to know each other a tiny bit, but that was really it for Madrid and me. I liked the wide boulevards. I liked the hotel and the good coffee. I would like to have seen flamenco. I would like to have been tourist more, seeing things, but as it is, Madrid is now in my mind lit by early afternoon sunlight, bright and strong, and it is a series of narrow alleyways littered with bars and cafes and small shops. And sometimes, that too is how it goes. A day that was meant to be filled with sightseeing is instead spent quietly, taking care of things and wandering around a little neighborhood. For now, that is Madrid in my mind. Have you ever spent a lot of time worrying about something ahead of time, only to find it was no big deal? Or the opposite, had something become a big problem you had not anticipated? The molecules of my body and brain are drifting home a handful at a time, plugging in the holes left by the challenges of actually moving one’s body thousands and thousands of miles across time and space and cultures and landscapes. For once, I’m trying to be patient with the process. I did not get a cold this time, which is often what my body seems to do in protest; instead I’m resting a lot. Walking the dog is my only exertion, catching up on blogs and posting photographs my only mental activities. 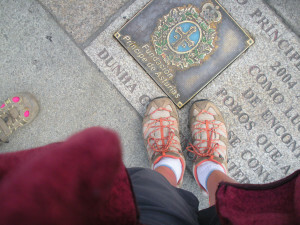 —Ana, our guide, has been walking and biking the various Caminos for awhile now. An American ex-pat who has lived in Spain for 30 years, Ana told me that one thing she likes to do it give away candy on the road, to weary pilgrims who look like they need a little lift. I saw her do it several times through the course of a day. A day or two later, I was walking alone when I saw an old, old man making his way down a steep rocky section. He had two rough walking sticks, one in each hand, and his knees were tied with white strips of cloth. He labored carefully, one bow-legged step at a time, and it was plainly very difficult work. I wished that Ana was with me, but she was a long way back on the trail. I wished him Buen Camino as I passed, but wished desperately for something more. Then I remembered I had some candy in my pack, so I walked a little further and dug it out, then walked back up the hill with it in my palm, offering it wordlessly since I couldn’t think how to say anything appropriate in Spanish. He looked at my hand for a moment, uncomprehending, then understood I was giving him candy and he gathered it up in gnarled fingers. His face lightened and blazed and he said, “Merci! Merci beaucoup!” I waved and walked back down the hill, suddenly overcome with emotion. How small a thing, and yet how large! I loved Ana very much in that moment for understanding that idea, and teaching it to me. —Walking suddenly beneath a canopy of trees, their joints grown over with moss to make faces like Green Men, the forest stretching out around us in lush, fertile mystery. Here be the fey and enchanted foxes and witches, called here meigas. Once we passed a marsh so alive with frogs that we almost couldn’t be heard as we puzzled out what was making that noise. Now and again, we crossed a pond or a stream on old flat rocks, and I couldn’t help but think of the pilgrims before us in their sandaled feet, hundreds of years of them. –Everywhere a little village, a bar, a church. All have their own particular sello, or pilgrim stamp. Among our group was a little contest–who had the most? Who had the most beautiful? I kept forgetting to get a stamp, but in the end, I didn’t mind. You have to have two per day to prove you’ve walked the distance, but that’s all. Most days, I had more. Often, I was lost in some other thing when we entered a place–admiring the wall of letters and postcards and messages and bandannas left behind in one; the colors of paint around the door in another; the German shepherd mix creeping up behind the bar to steel pigs feet and ears from the back step; the long limbs of a cyclist in tight shorts. —an old woman walking up the street with a wheelbarrow in Lavacolla (wash your bottom town–where once pilgrims were required to stop and wash before they walked the last six miles into Santiago). 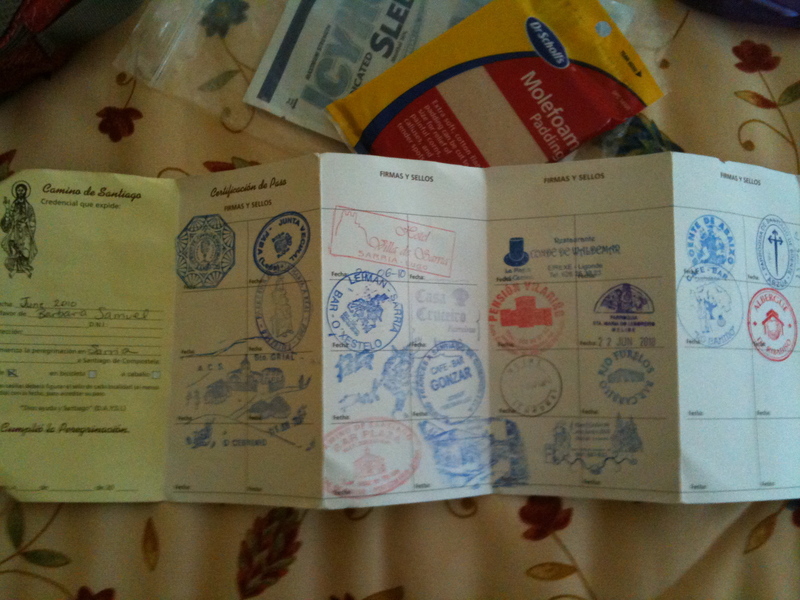 We are drinking cerveza con limon, checking stamps in our passports. She’s jaunty in a blue dress and an apron, and we wave. She greets us cheerfully, and comes back a little later with a giant, professional flower arrangement. Beautiful! I cry. She lifts her chin, smiles. For the graveyard tonight. And there is a festival that night that begins at midnight. Everyone is out in the streets. There is a band playing, loudly, singing, and everyone is dancing and singing and talking all through the town, until four or five. My roommate is grumpy. I keep thinking it would be fun to go join the party, but in truth, I’m too tired after seven days of walking to rouse myself, so I drift in and out of sleep, listening to the party pouring in through our open windows, and it makes me think of nights when the children were little and we played cards and drank beer with friends, when the children fell asleep in puddles on the couch or the floor. I had no idea that I would miss those days so much. We were poor and the food was simple, the children barefooted and everything I thought I wanted seemed far away in the future on the other side of some magical line. –the astonishing, impossible grandeur of the cathedral at Santiago. I have seen many spectacular palaces to the glory of God, including the Vatican (and most recently the splendid York Minster) but Santiago’s abode is tremendous, with wings and stairs and gold and turrets and spires and gold and dozens of entrances and gold and carvings and statues and gold. Did I mention gold? The entire altar is drowned in gold and jewels, so much gold it is impossible to calculate the cost of it. The statue of Santiago himself is almost entirely made of gold. It is a giant thing, much larger than a human, and one of the pilgrim rituals is to “hug the saint.” Once we had our official certificates, we stood in line to do this, not all of us at once, but in twos and threes, after one had showered, another had found trinkets to take home. There was in front of me a quintuplet of Spaniards in late middle age. One of the women paused behind the saint, whipped a baby wipe out of her purse, and wiped it down before she stepped up and gave Santiago a hug, putting her face on the gold between two enormous topazes. I hugged him, too, but really found pleasure in the glimpse of the church from that vantage point. Later, at Mass, we had a chance to see the fabled censer. It’s more than four feet tall, carved of silver, and it swings the entire length of the transcept—hundreds of feet in either direction, pouring out incense to fill the church with fragrance. It nearly touched the ceiling on one side, then the other, over and over. It’s hard to describe in a way that captures the beauty of it. A worthy destination for those long ago pilgrims, and all of us, too. I was giddy by the time mass started, however, and I will admit that I found myself sometimes trying to surpress a giggle over the lispy Gallegan of the priest. It was not disrespectful, but joy and weariness in equal measure. Before I left, I read somewhere that the journey begins when the Road ends (have not been able to find it again, sadly, so if anyone knows, please tell me), and as I sit here now, I can see that’s true. 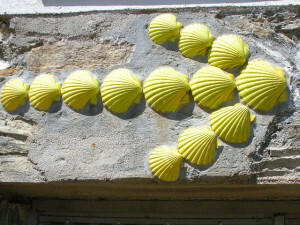 I will be going back–perhaps to walk the Camino Primitivo, or the northern road, or maybe the entirety of the Frances. It does feel I’ve only begun. A dog comes bolting from the meadow behind a bar (not a bar like the US, but like a very small cafe with beer or sidra and maybe a few trinkets) where we stopped for our morning drink break. She is a big sturdy golden lab mix, trailing her broken chain, and a tumble of seven puppies, yipping in frantic effort to keep up. Mother trots blithely down the road, dives into the trees surrounding a field, pups hurry to catch up, disappearing one by one. One morning awakening to a rooster crowing, over and over, then opening the windows to see a vista of mist and ancient buildings and a brand new supermercado and windmills on a hill in the distance. Old and new, ancient and modern, all mixed up. Walking with women on the Camino, talking, talking, talking. Sorting through the confusion of how to choose a career path with one young woman, talking about work and writing and relationships with others. Walking alone, I listen, too, and meander through the past decade, which has been both tumultuous and incredibly rewarding. Wandering through the Spanish countryside at the pace of…well, a walker. Slow enough to really see things. The chickens in a yard, sable and shiny and hearty looking. (Now these are free range chickens!) There are forests of deep shade, and fields of peppers and corn and beans. Old dry stone walls, a house overrun with vines, a freshly build hacienda with gigantic fuschia and hydrangea bushes. In the evening, the sun stays up until past ten, and we walked around after dinner last night, letting it paint our skin pink. Almost to Santiago. We will arrive tomorrow. I will be sad to leave my new friends, but also glad to go home to my beloved CR and Jack. The girls in the basement are waking up, looking with glee at all the stuff I’ve collected for them. We’ll see what they make of it all.